As we wind down 2018, it’s fun to take a moment to catch our breath and look at what 2019 holds for us. 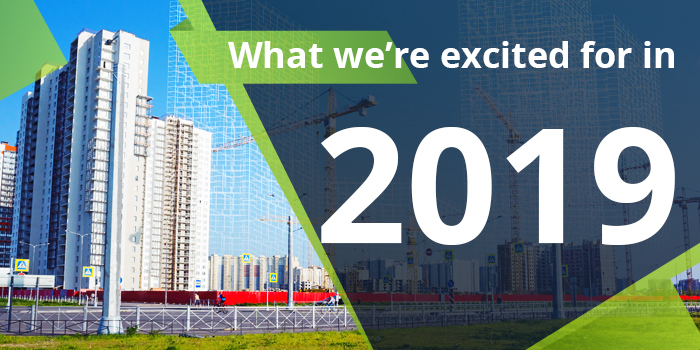 Last year’s list of trends, focused on exciting advances in construction technology; robotics, drones, ioT, etc. While tech is still trending up, this year’s spotlight is on trends driven by people and the environment. While restoring old building isn’t new, there is a growing trend to take more care to repurpose historic and iconic buildings. Gone are the days when “old” buildings would be razed to make way for new, more modern buildings. Now, we’re seeing more exhaustive exploration and creativity being used to find ways to save the buildings, before tearing them down becomes an option. The old standard operating procedure to demolish “outdated” buildings for new developments has been rethought for cultural (historic) and environmental impact, and now these beauties are being given new life, with impressive and marketable results. In California, there is even a new trend to give old motor lodges new life as boutique hotels. Our current favorite example is the Spruce Goose hangar being turned into offices for Google. Even more impressive than the dramatic results, was the fact that salvaged materials were incorporated back into the design of the space and even used in the office furniture. More women entering traditionally male dominated fields is a timely trend, reinforced by the recent, historic election in which a record number of women were elected to congress. Women entering the construction industry has especially taken off in the last couple years. It’s not just more women filling jobs, now there is access to more educational programs and events to encourage participation, provide training and offer support. We’ve even seen an all-female crew prove there are no gender boundaries to construction. This is an important trend to finally start to bridge the gender gap, and it may even impact the ongoing labor shortage. However, it’s still not without challenges. While perceptions are changing, women still face discrimination and harassment. But with special apprenticeship programs, networking and mentorships becoming more readily available, the door for women in construction has opened wider. Recently, we participated in the 20th Annual Lean Construction Congress, held by the Lean Construction Institute (LCI). What struck us most was that attendees were there for education on how to improve their business; it was definitely not a boondoggle to Orlando for participants. This dedication to lean education emphasized the growing industry interest and commitment to implementing its practices. Lean principles have been practiced in manufacturing since Toyota developed the approach after World War II. Yet, the construction industry has been slow to adopt the practice. According to the LCI, construction efficiency has decreased while all other (non-farm) labor efficiency has doubled. But that is changing. Based on methodology of maximizing value while reducing waste of materials, time and effort, lean construction focuses on the whole process to remove waste and create continuous improvement. This leads to higher quality, lower cost projects. With rising material costs and the continuing labor shortage this trend to work more productivity while eliminating waste is right on time. Additionally, construction project management software, like SKYSITE, can be part of solution to implement lean principles. Once the domain of companies with grand visions and deep pockets (like the Apple Park), constructing a sustainable building was often out of budgetary reach for many. But that is beginning to change. According to the World Green Building Trends 2018 report 47% of those surveyed expect more than 60% of their projects to be green by 2021. What is causing the change? While there is still a perception that sustainable building materials and fixtures are more expensive, the costs have steadily been coming down due to increased demand, allowing sustainable products to be incorporate more and more into everyday design. Other factors driving demand include increased corporate social responsibility, client demands, creating healthier buildings and, of course, environmental regulations. Green buildings also often have unique design features that not only provide beautiful aesthetics, but aim to improve the environment, making them attractive to tenants. While obstacles to sustainable building still exist; including perceived costs, hassle to obtain certifications, and lack of incentives, the increases show “going green” continues to gain momentum. We admit, in the beginning, we bought into the hype surrounding the Amazon HQ2 search. But the search dragged on for 14-months as they sifted through 238 proposals from cities across North America. During the search, there was endless speculation of which cities could land the prestigious project, with predictions including Boston, Philadelphia and Nashville. A short list of 20 finalist cities was announced in January of 2018, yet the search continued until November. Throughout the search, there were endless articles analyzing every move, eventually leading to media oversaturation. Interest waned and despite all the build-up, the final announcement seemed anti-climactic. Even now, post HQ2 decision, the media attention analyzing every detail keeps on going and going. Rarely does a day go by that there isn’t at least one article in my newsfeed about the projects. This overexposure has landed it on top of our list. This is a serious issue, with 80% of 2,500 construction firms recently surveyed, reporting difficulty finding qualified labor. We’re over this, not because we don’t take it seriously, we do. But, we’re optimistic that in 2019 some of the initiatives being implemented will begin to make a dent in the crisis. From training, to recruiting, to more women joining the industry, we hope 2019 will see more positive news for construction labor. While these elements of new buildings, such as the newly opened Mahanakhon SkyWalk, may be exciting and offer a thrill at first, the novelty quickly wears off and they fade away. But what price are we paying for the novelty and quick thrill of glass slides, massive waterfalls, glass bottom, cantilevered pools, etc.? What danger were workers placed in when building? What resources are being wasted? These unique design features may have a “cool” factor, but what value do they actually provide? While edgy design will always have its place, we’re over designs that go way over the top to create a buzz.